I have posted many pictures of my kitchen counter. It is small and always empty. I am sure you think I clear it off and put the clutter on the table before I take the pictures. After all, there are always appliances on a counter top. Right? Wrong! My counter looks exactly like that…empty…most of the time. So where are the appliances? I store them in the upper cupboard where they are close at hand when I am ready to cook. I had to give away my extra glasses and cups to make room. (I store the glasses I use for my dinner parties in a box in the basement near the table.) My toaster ended up on top of the china cabinet, on a tray to collect the crumbs, and my microwave is on top of the dishwasher. 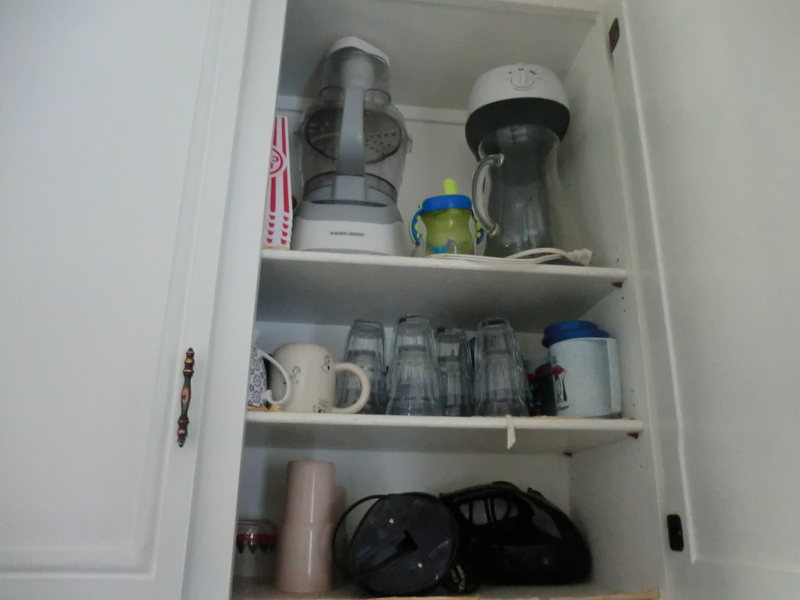 The problem is not that your kitchen is too small or there is no storage; the problem is we all have too much stuff. My can opener and mixer are on the bottom shelf. This entry was posted in Decorating, Give It Away, Use What You Have and tagged Decorating, Giving, Use What You Have by Frugal Fish. Bookmark the permalink.